John E. Fitzgerald Larceny is a wheated Kentucky bourbon coming from Bernheim Distillery owned by Heaven Hill Distilleries. Wheated bourbon means that the secondary grain used in the mash bill is wheat rather than the more conventional choice of rye. Wheat makes the bourbon smoother. The Old Fitzgerald brand gets its name after John E. Fitzgerald, a bonded treasury agent, who built a distillery on the banks of the Kentucky River in the 1870’s. He held the key to the bonded rickhouses stored with bourbon because those days he was one of the only people legally allowed to carry those keys. That’s where the Larceny logo gets its idea. The brand was registered in the 1880’s by S.C. Herbst. Julian P. “Pappy” Van Winkle bought the rights during Prohibition and moved the production to his distillery. The rest is history as Old Fitzgerald became one of the greatest wheated bourbon brands in the world. 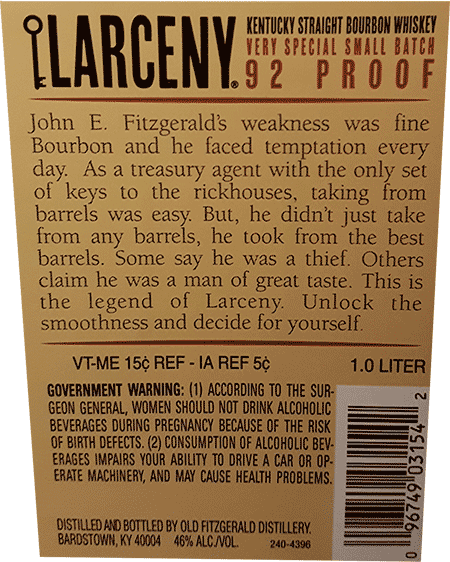 Larceny is a small batch bourbon made out of 100 barrels or less, but yet it’s very cheap. It’s not the most known Old Fitzgerald bourbon and I’m not surprised. At least I wasn’t impressed with it at all. Larceny has bourbons ranging from 6 to 12 years of age. To my surprise, it isn’t as smooth as one would think because of the wheat majority. 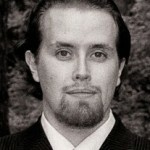 Larceny left me a bit cold, being quite one-sided and harsh. Like Dolph Lundgren, who by the way, has a starring role in a movie called Larceny. John E. Fitzgerald Larceny bourbon has gotten some great reviews: Double Gold Medal at the 2014 San Francisco World Spirits Competition and Whiskey Magazine’s “Best Buy” bourbon for example. Somehow it just wasn’t my “cup of tea”. Nose: The wheat influence is strong, you can really feel it in the aromas. Very floury, with some spices. Notes of honey, corn and cinnamon, with a small oak influence. Taste: Warm and spicy with notes of sweet corn and honey. Lightly peppery, yet very syrupy. Cinnamon and peppers give a harsh kick, which is not a typical wheated bourbon palate. Finish: Way too fast, peppery and spicy with touch of honey but everything is quickly over. Balance: I would have wanted to get some more wheat influence. Apart from the aromas, Larceny isn’t very smooth and the fast finish didn’t leave much of an impression. Decent bourbon, the low price point suits well for this Kentucky dram.